Post: Gaurav Akrani. Date: 9/21/2011. No Comments. Label: Finance. Corporate finance means only the finance of joint-stock companies. It is a narrow term. Corporate finance includes planning, raising, investing and monitoring of finance in order to achieve the financial objectives of the company. The followings are included in corporate finance. Raising the finance : The finance manager raise (collects) finance for the company. Finance can be collected from many sources, viz., shares, debentures, banks, financial institutions, creditors, etc. 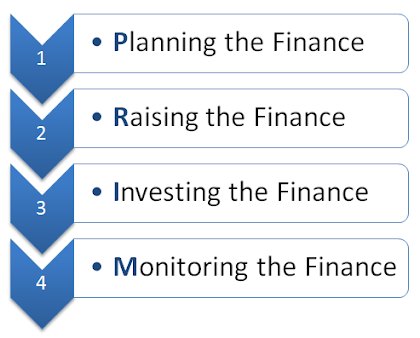 Investing the finance : The finance manager uses the finance to achieve the objectives of the company. There are two types of corporate finance, viz., fixed capital and working capital. Fixed capital is used to purchase fixed assets like land, buildings, machinery, etc. While working capital is used to purchase raw materials. It is also used to pay the day-to-day expenses like salaries, rent, taxes, electricity bills, etc. Monitoring the finance : The finance manager monitors (i.e. controls and manages) the finance of the company. He has to minimise the cost of finance. He has to minimise the wastage and misuse of finance. He has to minimise the risk of investment of finance. He also has to get maximum return on the finance. Monitoring the finance is an art and science. It is a very complex job. There are new tools & techniques for monitoring funds.